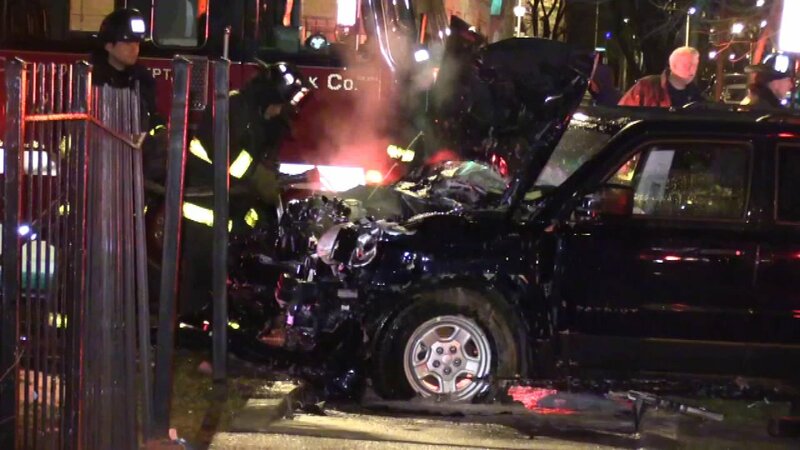 CHICAGO (WLS) -- An SUV slammed into a building and caused a fire early Wednesday morning on Chicago's West Side. A source said it all started when the SUV hit another car. The SUV then hit a gas meter around midnight near West Jackson Boulevard and South Kilbourn Avenue in the city's West Garfield Park neighborhood. Utility crews came to the scene to help firefighters. They poured foam around the area to keep the flames from spreading. A man named Kenny, who called 911, said he helped pull a man from that car and warned neighbors about the fire. "I heard a big crash. When I opened out the door, she was pulling up right at the door. The car was pulling up right at the door when I was opening up the door and I was like, 'What is going on?'" Kenny said. The source said no one was hurt.